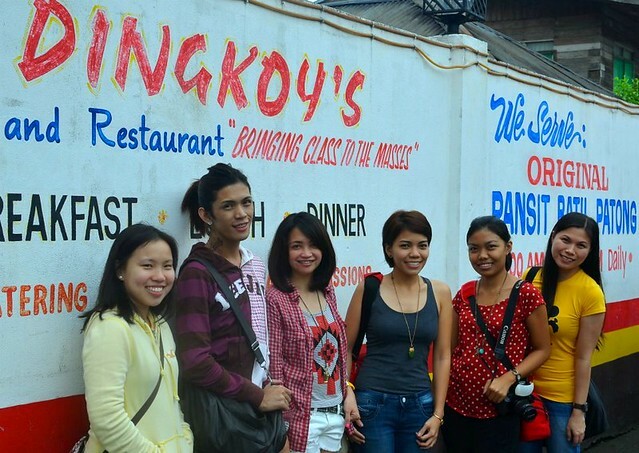 So going back to the food trip, we went to Dingkoy's Bar and Restaurant. 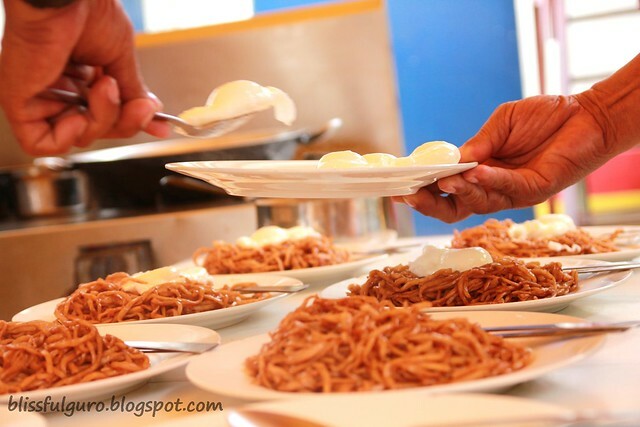 The pansit houses here only serve pansit - literally. No other food but pansit. 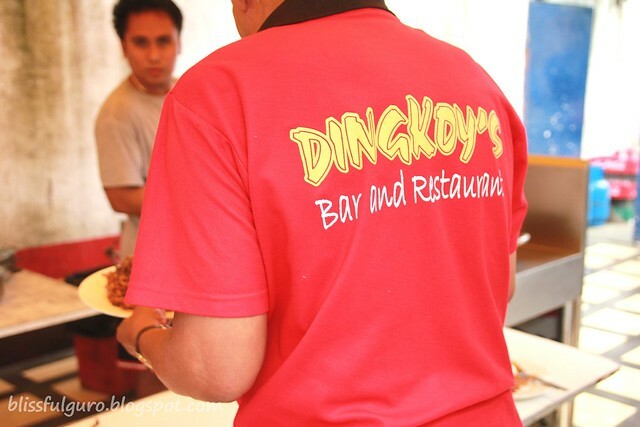 Dingkoy boasts its original pansit batil-patong and we were so ready to try their specialty. ze group L-R: dra. ivy, doni, peng, me, chyng and our host - sol. We ordered their super special which had chorizo, carabeef (carabao meat), liver, lechon kawali (yummy) and egg for only 60 bucks! Quite a steal right? They also have a seafood counterpart for the non-red meat eaters. They have an open kitchen and they cook your food right in front of you. We watched how they cook the pansit and observed how they carefully layer those yummy ingredients on top of each other. We first noticed the eggs - they were poached. 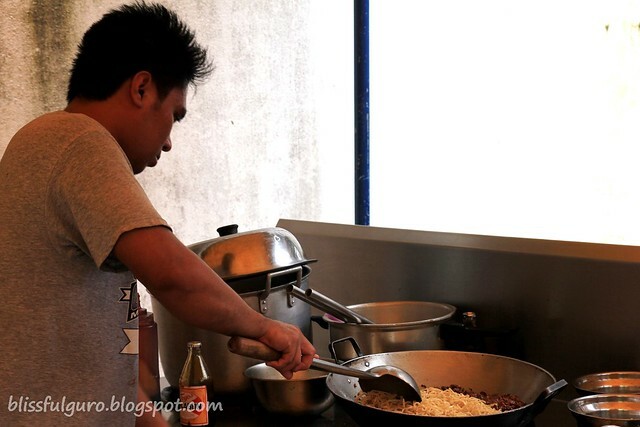 And then the other ingredients - toasted chorizo, the carabeef, the yummy lechon kawali and the liver (you can omit any of those - just tell them beforehand). We got hungry more and more after each ingredient. And the aroma? I can't describe it but it smelled fantastic (huh?!). 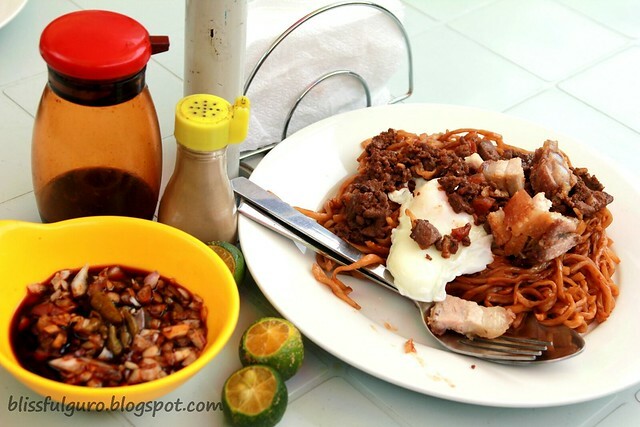 Pansit batil-patong is unique because of the egg. 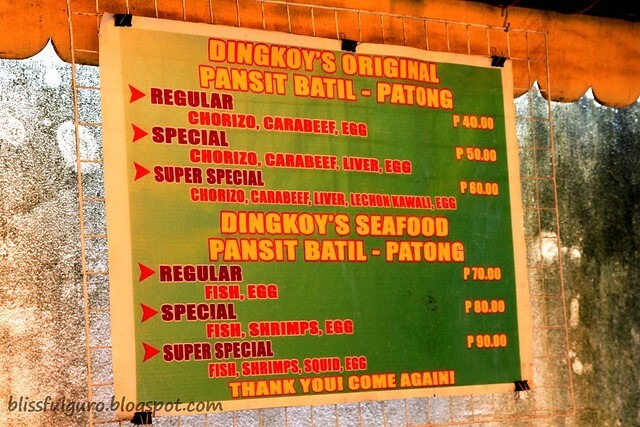 The "batil" part was on the soup (kinda like nido soup - the egg was beaten into the soup). 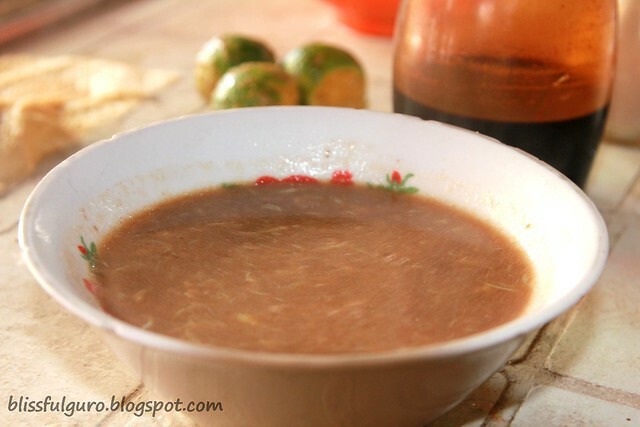 They give you this soup but you should have it right after finishing the pansit - yes, soup after the main dish. That's how it should be eaten. 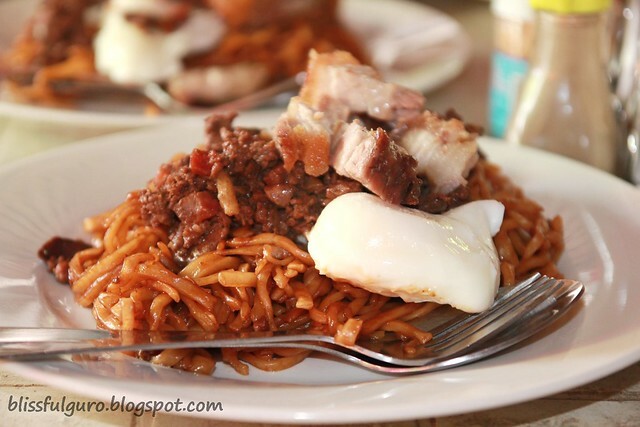 The "patong" part was the poached egg on top of the pansit itself. Nice. They also served a special sauce (read:sawsawan) which looked like your typical soy sauce with lemon (calamansi) and chili (sili) thing but with a twist - it also had some shredded red onions. Of course I failed the "soup-right-after-the-pansit" part because I can't resist the yummy look of it and I like my soup before the main meal. Bad me. The taste was - uhm, like a soup. Maybe if I ate it the "right" way I would've appreciated it more. 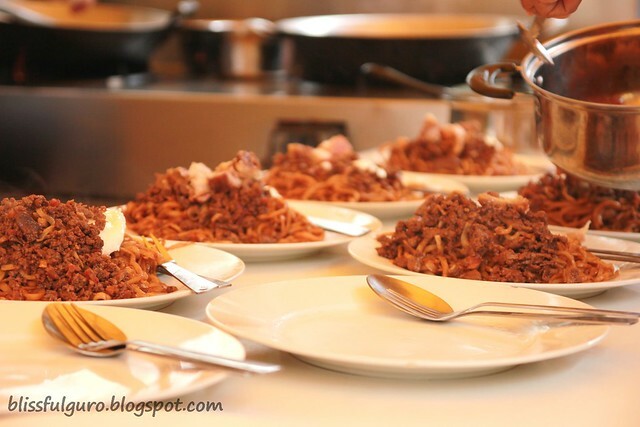 I dug in into my plate and tasted the bits and pieces that was incorporated into my pansit. It tasted different and I appreciated it more with the sauce. It was really different. The texture of the lechon kawali and the egg, they compliment each other. Pano na nga ulit yun? The group's verdict? 2 out of 5 didn't finish their pansit. You know why? They didn't like the carabeef. In some terms they call it "maang-go". I told them to remove the carabeef instead but they still can taste it thus, it ended their meal. As for me, it's ok. I can still remember how it tasted and how I felt after eating it. I dunno if it's good or bad but I finished everything. 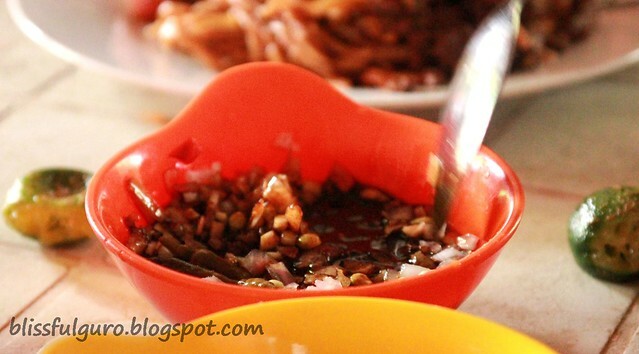 It's unique and it's really a must-try when you're in Tuguegarao. i haven't tried carabeef or anything with it. baka pag may chance ako makatikim, maalala ko bigla sagot ko sa ielts exam ko last nov --i was proudly describing a carabao to the speaking examiner. maiyak p matawa ako siguro habang kumakain. I'm worried about the 40% passing "grade" for the pansit taste test LOL. and napansin ko din yang "class to the masses" tagline.. ang bongga! 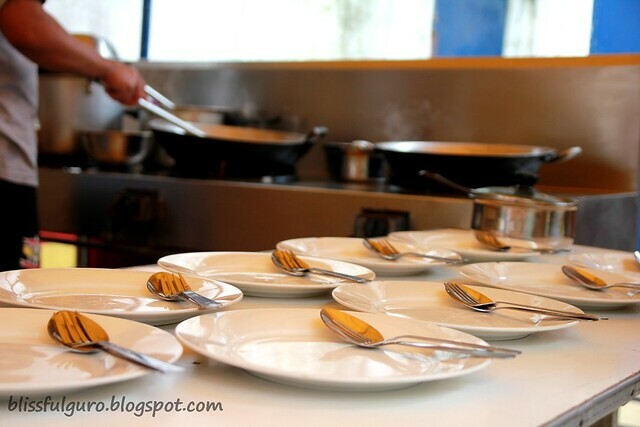 kasi yung ibang pansitan daw eh nasa kalye lang so sila pang "class" dahil restaurant style! 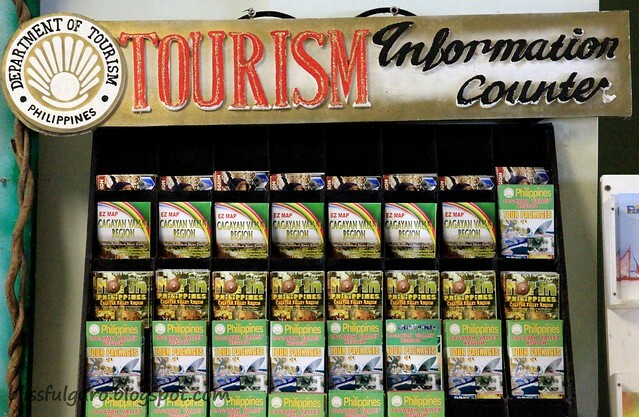 nalungkot ako bigla di ako makakasama dito sa tuguegarao + palaui trip namin sa march. gusto ko pa naman tikman tong pancit batil patung:/ anyhoo nakakatakam ung mga kuha mo.